One of the easiest and cheapest ways to advertise your business, politics, personality or job skills is through the creation of a website. Since most professionals charge an arm and a leg to get your website up and running, we here at Host-Finder.net thought we’d put together a simple guide that provides you an easy, step-by-step tutorial on the various steps required in making your own website. This tutorial is designed to be an extremely basic and easy be follow intdroduction and we highly recommend that you look into each topic in greater detail before starting on your own web development process. The first thing you need to do is decide on a name for your website and get a URL for it from a domain name registrar. 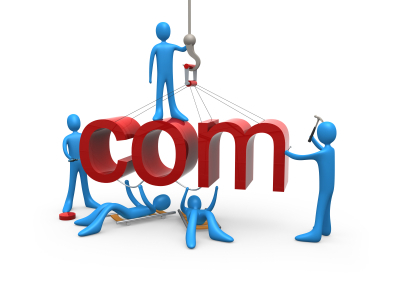 This name is known as your “domain name” and acts as the primary access address for your website. To get your website address registered you need to visit a popular domain name registrar, like namecheap, and follow the step-by-step guidelines to registering a name. A domain name will cost you anywhere from $5 to $25 per year to register depending on the name you choose. You should not need to spend more than this, if you do, than the company you’re trying to register with is probably ripping you off. Make sure you register a name that best represents your business so that people can remember it and it can easily be searched for. If all the domain names you want are taken, try being a bit creative. You can also use services like LeanDomainSearch.com to help you narrow down a quality name. A web hosting provider is the actual home for your website. Once you have a domain name from Step 1, the next step is to choose a web hosting provider that provides all the necessary features needed for your site. A web hosting provider should provide you with storage space, bandwidth, datbaases, and dozens of tools to help in creating your web pages and email accounts. A good web hosting provider should provide help and support in getting your site up and running and have a long history of quality website hosting. To sign up, simply visit a quality web hosting provider like FatCow, GreenGeeks, or iPage and check out the different packages they have to offer. If you’re on a bit of a budget, check out our top 10 cheap web hosting providers list. The next step is to create your website including all the various pages you’ll need such as an About page, a contact form, information about your business, and other general site content. To do this you’ll either need to build a site from scratch or use a popular site building package like WordPress, Drupal, Joomla, or Ruby on Rails. There are many free site building packages, but some may require you to purchase them, so be sure to do your research on which one is right for you. Once you’ve made a decision, your web hosting provider should have all the necessary documentation and support to help you get up and running. Step 4. Testing 1, 2, 3! While it may seem pretty obvious, this step is also extremely vital. Once you’ve setup your website you’ll want to make sure it’s accessible to everyone. Make sure you test your website in all of the major web browsers including Firefox, Internet Explorer, Safari, and Google Chrome. Each of these have various different quirks that can change the way your site looks. Also, make sure you check your website for the warning sights of a bad web hosting provider to make sure you aren’t being ripped off by a sub-par web hosting provider. If your website loads correctly and each individual page seems to have good functionality, you are good to go. Make sure you test it from everywhere including at home and the office (and even on your smartphone) to make sure all your customers can visit however they like. If the type of website you’re setting up is a storefront, you’ll want to add a credit card form and payment button on your website. Generally, this requires you to have a merchant account at your bank or simply use a third party purchasing provider such as Google Checkout or Paypal. These providers are sometimes free and sometimes charge a fee, so be sure to do thorough research before making a decision. Now that your new site is up and running, you need people to visit it. Some easy things you can do to help you get started include getting your site added to Search Engines. Simply visit the search engines, like Google and Bing, and they will have a place where you can submit your site. Also, you may want to advertise your business on popular platforms such as Facebook and Google Adsense. Finally, you can try good old fashioned word of mouth. Sites like Twitter, Facebook, Reddit, and Youtube are great for promoting and letting others know your site exists. After all, if a website exists on the internet and no one knows about it, does it truly exist at all? When is it Time to Switch to Better Hosting? Host-Finder.net is a professional review site that maintains accurate listings of top web hosting providers. We make no representation or warranty for any of the content provided by this website. This website and its content are for informational purposes only and is not intended to provide advice of any kind. This website is operated by a for profit business and as such we do receive compensation from advertisers on this website. This compensation includes, but is not limited to, paid advertising placements, referral fees, contextual advertising links and sponsorship packages. However, all rankings and reviews are 100% impartial and advertising fees are never used as a basis to adjust rankings or reviews within our site. RELIANCE ON ANY INFORMATION ON THIS WEBSITE IS AT YOUR OWN RISK. http://www.host-finder.net IS NOT RESPONSIBLE OR LIABLE FOR ANY ADVICE OR OTHER INFORMATION, SERVICES, OR PRODUCTS THAT YOU OBTAIN THROUGH THIS SITE. Copyright © 2012 host-finder.net. All Rights Reserved.